Overweight adults can help protect themselves from diabetes and heart disease by adding walnuts to their diet. That’s the conclusion of a new Yale University study published in the Journal of the American College of Nutrition which put a small group of adults on a walnut-enriched diet for two eight-week sessions. For their research, scientists chose 46 adults between the ages of 30 and 75 who had a body mass index larger than 25 and a waist circumference exceeding 40 inches (102 cm) for men and 35 inches (89 cm) for women. All exhibited risk factors for metabolic syndrome, a precursor of diabetes and cardiovascular disease, and none were smokers. Participants were assigned to either a walnut-enriched ad libitum diet or an ad libitum diet without walnuts. Those who followed the walnut diet were instructed to eat 56 g of shelled, unroasted walnuts a day as a snack or with a meal. At the end of the experiments, scientists observed improved endothelial function in overweight adults who consumed walnuts. Endothelial cells make up the inner lining of blood vessels and help with blood clotting and the formation of new blood cells, regulate inflammation and control blood pressure. No participants in the walnut-eating group gained weight. "We know that improving diets tends to be hard, but adding a single food is easy," explained lead author Dr. David Katz. "Our theory is that if a highly nutritious, satiating food like walnuts is added to the diet, there are dual benefits: the benefits of that nutrient rich addition and removal of the less nutritious foods." The Yale study is the latest research to vaunt the health benefits of walnuts. A longitudinal study out of Spain published this summer found that people who ate nuts, particularly walnuts, tended to have a lower body mass index and a smaller waist, were less likely to smoke and were more likely to be physically active compared to those who never included nuts in their diets. 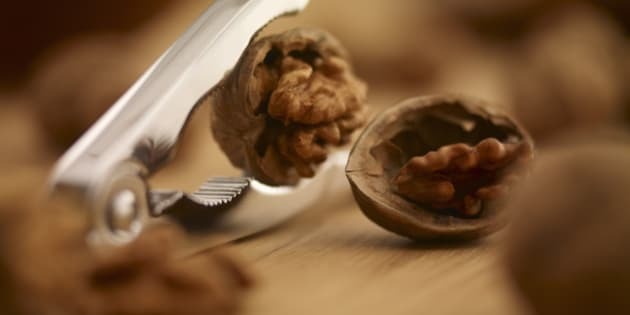 Overall, nut eaters had a 39 percent lower mortality risk and walnut eaters had a 45 percent lower risk.